We are happy to inform you that NGO Forum for Urban Water & Sanitation is presenting you an e-copy of Partner’s Newsletter from this month. The newsletter is intended to inform its members, partners and stakeholders the latest programmes, activities and events. We would seek your feedbacks and suggestions and expect you to utilize this newsletter at your level best. Kathmandu, June 26: Students of Tri-Chandra Campus and Durbar High School and representatives of different social organizations cleaned the historic Ranipokhari premises. The students were accompanied by police personnel and sanitation staffs from Kathmandu Metropolitan City. The participants of the cleaning campaign collected around 40 to 45 dokos of grass, weeds and waste from the pond premises. The cleaning campaign has been successful to raise awareness among the students on the conservation of historic pond. In addition to cleaning the pond, additional rainwater harvesting system has been installed in Saraswoti Sadan and tutorial building of Tri-Chandra Campus with financial support worth Rs. 174,530 from WWF Nepal and technical support from NGO Forum for Urban Water & Sanitation. Ranipokhari now gets 3.5 million litres of water annually including 0.8 million litres from the new system. Kathmandu, July 2: A group of WASH stakeholders met with Ms. Binda Pandey, Chairperson of the Committee on Fundamental Rights and Directive Principles (a committee under the constituent assembly committees) to discuss the inclusion of improved sanitation and safe water as basic fundamental right in the constitution. In the interaction held at the committee office in Singha Durbar, Ms. Pandey expressed that the committee was sensitive about incorporating right to water and sanitation which is a vital necessity of the people in a workable manner in the constitution. The group comprising of members of the Nepal WASH Group, FAN South Asia and End Water Poverty Campaign, participating in this interaction suggested that the new constitution duly acknowledge the Delhi Declaration of the ministerial level South Asian Conference on Sanitation (SACOSAN III) held in New Delhi on November 16-21, 2008, which recognizes that access to sanitation and safe drinking water is a basic right and that it is imperative to accord national priority to sanitation. During the discussion it was also emphasized that sanitation and water should be established as a constitutional right all the more reason because these services has a direct impact on sectors like health, education and poverty reduction which hold great national priority. Chairperson Pandey expressed that it is the responsibility of the state to provide these basic necessities to its people, hence as far as possible priority will be given to include these provisions in the constitution. She also informed that in the next one month a draft of the fundamental rights and directive principles was on its ways and welcomed written comments on this draft and assured that the comments would be considered possibly and positively. 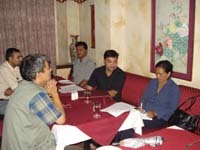 Kathmandu, July 10: Executive Director of Environment and Public Health Organization (ENPHO) and treasurer of NGO Forum Bhushan Tuladhar was elected as a Board Member of Climate Action Network South Asia (CANSA) during its Annual General Assembly held in Kathmandu on July 10, 2009. Climate Action Network is a global network of 450 NGOs working to promote government and individual action to limit human-induced climate change to ecologically sustainable levels. It has seven regional offices, including CANSA, which was established in 1991. Mr. Tuladhar is also the coordinator of Climate Change Network Nepal, a network of organizations working on climate change related issues in Nepal. 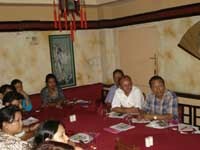 Kathmandu, July 26: Staffs and board members of NGO Forum gathered together in a strategy workshop organized in Kathmandu to prepare organizational strategies and action plans for the next three years (July 2009- June 2012). Ms. Lajana Manandhar, President, NGO Forum highlighted that the workshop aimed to review achievements, identify gaps, weakness and challenges of the Forum and to recommend short-term and long-term strategy for planned development and expansion of its activities. 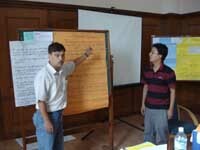 Members reviewed the achievements of NGO Forum and identified issues and challenges through brain storming among them. Similarly, they identified vision, strategic objectives and indicative actions and established a basis to prepare action plans of NGO Forum for the next three years. A final workshop will be organized soon to finalize the outputs of the workshop. 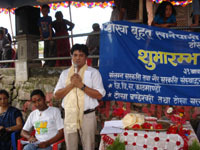 Kathmandu, July 31: LUMANTI Support Group for Shelter organized its 16th annual general assembly at the Multipurpose Martial Arts Building in Khusibun. Social auditing of Lumanti’s activities in association with different organizations and communities in the last year were completed in the general assembly. Executive Director of Lumanti Ms. Lajana Manandhar presented the annual report of LUMANTI. She highlighted on the programmes and activities of LUMANTI in the previous year. 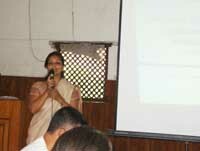 Similarly, Dr. Anita Manandhar, Treasurer, LUMANTI presented the financial report of the organization. 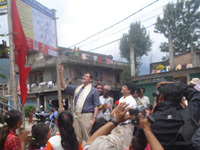 August 7, 2009: FRC Monitoring Campaign 2009 was launched amidst a programme held at Kathmandu Upatyaka Khanepani Limited (KUKL) office. NGO Forum for Urban Water & Sanitation has collaborated with KUKL in this year’s FRC Monitoring Campaign under the Safe Water & Hygiene Campaign 2009. Addressing the meet, Mr. Gyanesh Nanda Bajracharya, Deputy General Manager, KUKL thanked NGO Forum for monitoring Free Residual Chlorine (FRC) in the piped water supply. “Actually it is the duty of KUKL to monitor FRC in water but it has not been able to do so due to lack of resources,” he added. He handed over 75 FRC test kits and 70 T-shirts to NGO Forum to kick off the campaign. Ms. Roshana Shakya, chief of Central Laboratory KUKL and coordinator of Safe Water and Hygiene Campaign highlighted different activities conducted by KUKL to monitor FRC in piped water. She trained the new volunteers to use FRC test kits to check amount of FRC in piped water supply. Highlighting the objectives and outcomes of FRC Monitoring Campaign being conducted by NGO Forum since 2004, Mr. Tri Ratna Manandhar, programme officer, NGO Forum told that the campaign has helped to draw attention of the concerned to improve water quality in the Kathmandu Valley. Kathmandu, August 14: Ms. Vidya Laxmi Shrestha, programme coordinator of Society for Urban Poor (SOUP) and general member of NGO Forum participated in a half day Inclusive Urban Policy workshop organized by Home Net Nepal (HNN). About 15 representatives from different development organizations participated in the workshop to discuss on the existing urban policy and planning in relation with urban poor. Highlighting the objectives of the programme, Ms. Sabitra Neupane, Project Manager HNN told that the workshop intended to develop networks in city areas with concerned organizations as well as Member Based Organizations who are working directly and indirectly with Home Based Workers. “This workshop will certainly help to review the policy and planning of the cities to develop the program especially for Urban Poor Home Based Workers,” she added. Ms. Pinky Singh, Consultant, HNN discussed about urban poor Home Based Workers based on interaction with 50 Home Based Workers. Mr. Prafulla Man Singh Pradhan, UN HABITAT Program Manager presented his working paper on 'Urban Policy and Urban Poor'. Mr. Arjun Koirala from Udle discussed on social and economic aspect of urban poor. Concluding the workshop, Mr. Om Thapaliya, Executive Director of HNN told that the workshop has been successful to identify the issues and problems of Home Based Workers and prepare plans to address their problem. Kathmandu, August 14: Ministry of Physical Planning and Works (MPPW) called a follow up meeting on August 14 to share about the Regional High Level Meeting on Rainwater Harvesting. Mr. Suman Prasad Sharma, Joint Secretary at the MPPW appreciated the valuable support from the stakeholders to make the regional high level meeting a success. He informed that there were 6 delegates and 16 participants from different regional countries with 175 national participants in the meeting. Mr. Prabhakar Man Singh, event manager of the meeting shared about the expenses details of the event. Participants of the meeting discussed about the challenges and possible way forward to take ahead rainwater harvesting in the country. They particularly stressed on the need to promote private sector in providing services on rainwater harvesting system. Mr. Indra Man Singh Suwal, officer at Kathmandu Metropolitan City informed about the provision of rebate on building permit fee upon completion of building construction if the house owner installs rainwater harvesting system. Mr. Singh handed over a token of appreciation and a copy of the meeting resolutions to all the contributing organizations. Kathmandu, August 15: Different government and non-government organizations have geared up to construct a drinking water project in Tokha that will tap water from three streams in the Shivapuri National Park and supply it to the Tokha folks through distribution network. The project aims to provide drinking water to 20000 people in the Tokha Chandeshwori and Tokha Saraswoti VDCs. Inaugurating the project, Mr. Andre Dzikus, Chief, Water and Sanitation Section II, Water, Sanitation and Infrastructure Branch, UN HABITAT-Nairobi opined that the unity of local people in Tokha will help the project to achieve success. Dr. Roshan Raj Shrestha, Chief Technical Advisor, South Asia Region, UN HABITAT requested the project implementing organization and Consumers’ Committee to conduct the project activities with active public participation. Ms. Lajana Manandhar, Executive Director, LUMANTI Support Group for Shelter informed that her organization will provide technical support to the project. “Responsibility for operation and maintenance will be handed over to the Consumers’ Committee after the completion of the construction work of the project,” she added. UN HABITAT is to provide financial support of Rs. 7.5 million to the project in addition to technical support. In addition to water supply facilities, it will develop a comprehensive sanitation master plan of Tokha through consultations and consensus of all stakeholders to guide the future sanitation improvement plan in integrated manner. District Development Committee-Kathmandu, Saraswoti and Chandeshwori VDCs have also made their solidarity by allocating budget of Rs. 3.15 million for the establishment of water supply system in Tokha. Lalitpur, August 16: A drinking water project has been launched in Lalitpur to demonstrate community rainwater recharge technique through restoration of traditional pond to facilitate increase in water discharge of selected traditional stone spouts. Inaugurating the “Rainwater Recharging Groundwater” project in Lalitpur, Mr. Andre Dzikus, Chief, Water and Sanitation Section II, UN HABITAT-Nairobi appreciated the active role exhibited by the local community people to establish the water management system. Dr. Roshan Raj Shrestha, chief technical advisor, UN HABITAT stressed on necessity of conserving local water sources and recharging ground aquifer for the sustainability of local initiatives taken for local source management. Mr. Binod Prakash Singh, CEO of Lalitpur Sub-Metropolitan City informed that water supply in the municipality has been given high priority in the fiscal year 2066/67 and allocated budget of Rs. 5 million for the purpose. He informed that some historical ponds in Lalitpur including Saptapatal, Purnachandi and Nhu Pokhari are being revived for recharging purpose. It has been expected to conserve 40,000 kilo liters of rainwater, besides benefiting the local community and opinion leaders to build awareness on water conservation and protection of traditional water bodies. Kathmandu, August 20: Representatives of different NGOs and WASH stakeholders met with Mr. Ang Dawa Sherpa, member of the Fundamental Rights and Guiding Principles Committee of the Constituent Assembly to discuss the inclusion of improved sanitation and safe water as basic fundamental rights in the new constitution of Nepal. Mr. Prakash Amatya, executive director of NGO Forum briefed about the importance of stating safe drinking water and basic sanitation as the fundamental constitutional rights with various references of MDG targets, UN conferences and SACOSAN III. Mr. Shakya Suren, Coordinator of Lalitpur Citizens Campaign, briefed about the current negligence of the government in absence of constitutional rights on sanitation and water. Mr. Rajendra Aryal, president of Federation of Drinking Water and Sanitation Users Nepal cited several constitutions where sanitation is respected as a fundametal human right in the constitution. He urged that sanitation need to be spefically written in the new constitution. Mr. Anil Sthapit, Director, Guthi referred to the various national policies and commitments of the government in the international commitments where we are bound to respect them in the new constitution as a fundamental rights. Kathmandu, August 23: Representatives of NGO Forum and partner organizations met with the visiting officials of Orangi Pilot Project, Pakistan to share and interact about the concept of community monitoring of water supply in the Kathmandu Valley. Dr. Bhushan Raj Shrestha, GIS Specialist, presented the concept of developing a water supply services monitoring mechanism in the Kathmandu Valley by consumers in coordination with the Kathmandu Upatyaka Khanepani Limited. “This will help to solve the problems in water supply by identifying the problems immediately,” he said. He shared the idea of using simplified maps of different pockets in a selected area having information of water supply lines. Ms. Parveen Rehman, Director at the Orangi Pilot Project – Research & Training Institute shared about their works in mapping of water supply in Karachi that helped to change the misconception of poor stealing away water from the main bulk supply lines. She stressed on the importance of community mapping of water supply and sanitation services for improvement in the services with help of evidence based advocacy. 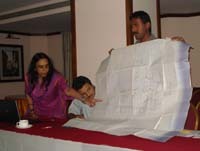 She suggested to mobilize community volunteers to trace and locate water supply lines in the map of their locality. Kathmandu, August 29: Environment and Public Health Organization (ENPHO) observed its 18th annual general assembly at World Trade Center (DECC Seminar Hall) in Tripureshwor, Kathmandu. Mr. Bhushan Tuladhar, Executive Director of ENPHO presented the annual report. Mr. Pratap Kumar Acharya, Treasurer, ENPHO presented the financial report of the organization. He informed that ENPHO’s total income for the year 2009/09 was Rs. 57234925.26 which was a 35 percent increase compared to the total income of 2007/08. He added that ENPHO’s total expenditure for the year 2008/09 was Rs. 52677377.13 which was 53 percent increase than the previous year’s expenditure.